Admiral Raymond Spruance was a U.S. Navy officer most remembered for his successful tactics against the Japanese in the Battle of Midway in 1942. An Indianapolis native, the USS Indianapolis served as his flagship throughout World War II. 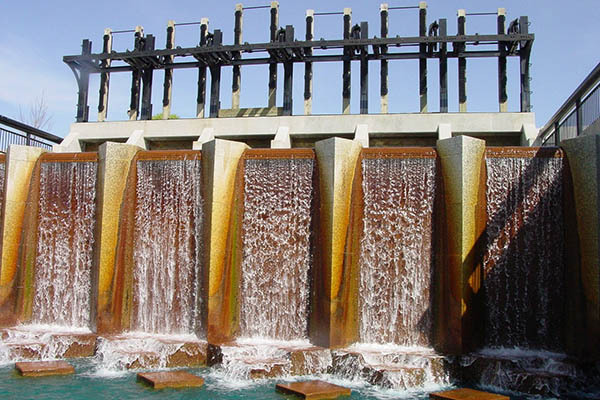 A basin, located on the north end of the Downtown Central Canal near the USS Indianapolis Memorial, is dedicated to this Indianapolis Naval hero. American Legion Mall, extending from St. Clair Street to North Street between Meridian and Pennsylvania, is home to the World War II, Korean and Vietnam Wars and the Cenotaph Memorials. The World War II Memorial is the first memorial shaped like a half-circle. The convex side tells a brief history of the war and pays tribute to Hoosier Medal of Honor recipients and distinguished Hoosier units. The opposite side features excerpts from letters sent home from the warfront and a timeline of events. 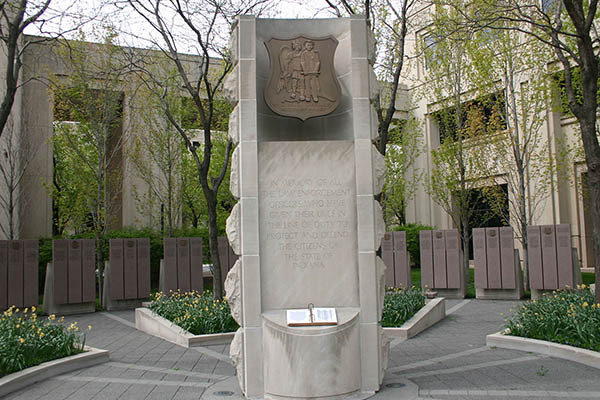 A database with the names of Hoosiers killed in action is located next to the memorial. The Korean and Vietnam Wars Memorial are two pieces of a whole cylinder - not equally split - because more soldiers were killed or missing in action (MIA) in the Vietnam War. One side features a map and letters sent home from soldiers. On the other side, visitors can find the names of Indiana veterans killed or MIA in both wars. The Cenotaph Square Memorial is an empty soldier's tomb honoring the hallowed memory of the dead who served in the World Wars. Explore the lower level of Soldiers and Sailors Monument, and you will discover the Col. Eli Lilly Civil War Museum. Created in honor of Indiana citizens who lived, fought and died in the Civil War, this museum exhibits Civil War remnants, including artifacts, letters, personal diaries and more. Located along the north end of the Canal in White River State Park is the Medal of Honor Memorial, recognizing 3,456 recipients of the nation's highest military honor from 15 major wars and conflicts. The memorial is arranged by 27 curved glass walls between seven and 10 feet high. The memorial also has a sound system, telling the stories of medal recipients. This small garden tribute to the firefighters who lost their lives in the deadliest fire in Indianapolis history is located in front of Rock Bottom Restaurant & Brewery at 10 W. Washington St. 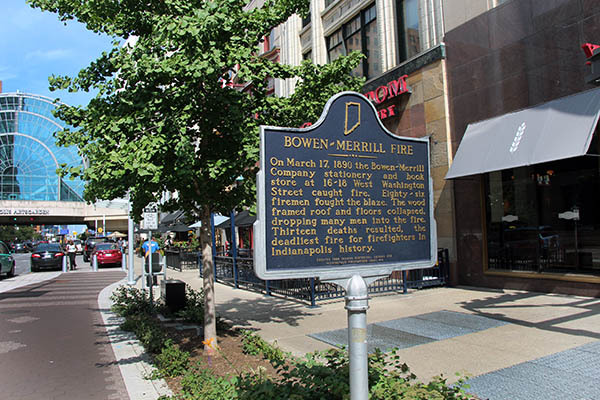 In 1890, 86 firemen fought the Bowen-Merrill Company Stationary Two Bookstore fire, 13 of them losing their lives in the blaze. Dedicated two days before the World Police and Fire Games in 2001, this memorial stands as a tribute to the more than 600 Indiana policemen and firefighters who have given their lives in the line of duty. It is located east of the Indiana Government Center and family members and co-workers continuously stop by to pay their respects to the memories of loved ones. 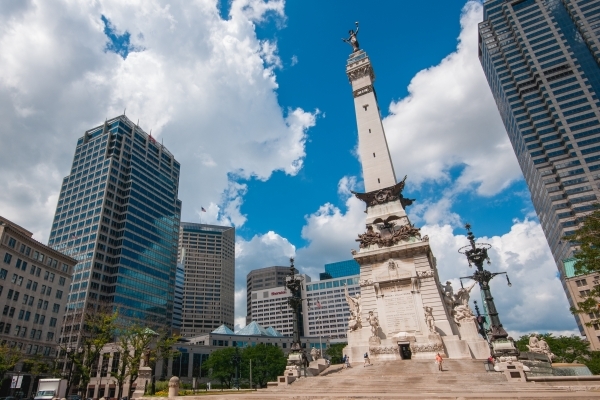 Located in the heart of Downtown on Monument Circle and recognized as one of the world's most exceptional monuments, the Indiana Soldiers and Sailors Monument stands as a symbol of Indianapolis and the state of Indiana. 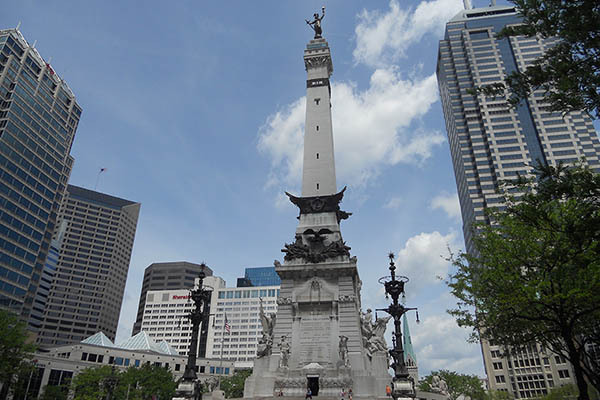 This 284-foot Indiana limestone memorial was dedicated in 1902 in honor of Indiana's soldiers and sailors who served in the Civil and Spanish-American Wars. Art surrounds the monument, including "War" and "Peace," sculpted by Rudolf Schwarz. "Victory," a 38-foot bronze statue weighing 19,300 pounds, sits atop the Monument. For the first time in 118 years, Victory was removed from the Monument in April 2011 for repairs. 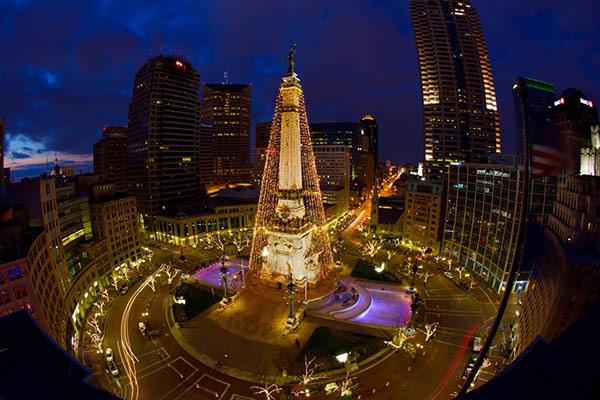 She was put back in September in time for the Circle of Lights® presented by IBEW #481 celebration. Schwarz also designed "The Dying Soldier,""The Homefront" and the statues at the corners of the monument. Take the elevator for $2 or walk to stairs for FREE to the observation level for a panoramic view of the city. This memorial, honoring those who fought in both World Wars, Korea and Vietnam, is one of the largest memorials in Indianapolis, standing 210 feet tall. 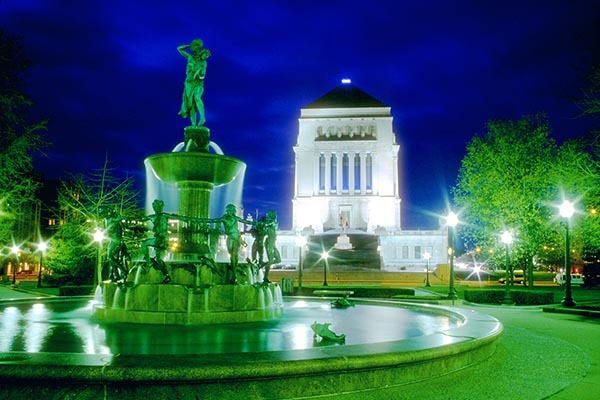 It occupies an entire city block of the War Memorial Plaza between Meridian and Pennsylvania Streets to the east and west and Michigan and Vermont streets to the north and south. Visit the Shrine Room, symbolizing peace and unity, on the top (third) level. On the main floor, visitors will find meeting spaces, the Pershing Auditorium and the names of all Hoosiers who fought in WWI and Hoosiers who were killed or MIA in WWII, Korea and Vietnam. The museum located in the bottom of the memorial exhibits the history of Indiana's veterans from the Battle of Tippecanoe to the war in Iraq. This is the oldest portion of the Indiana War Memorial Plaza, once the planned site of a university in 1821. With the plan never coming to fruition, the southwest corner of the park became home to the Marion County Seminary, the city's first high school and several churches. The building was torn down in 1860 so the park could be a drilling ground for the Union troops. Following the war, the area was converted into a park. The centerpiece of the park is the Depew Fountain, dedicated to a physician from Indianapolis named Dr. Richard Johnson Depew. Designer Karl Bitter died before the fountain's completion. Alexander Stirling Calder completed Bitter's work. 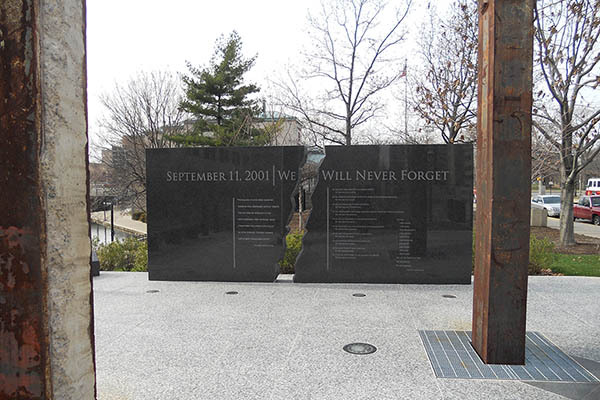 Project 9/11 Indianapolis began in 2010 by Greg Hess, an Indianapolis firefighter/paramedic, as a grass roots effort to establish a memorial dedicated to honor those killed in the Sept. 11 attack. Two 22-foot steel beams from the World Trade Center are the focal point of the Project. The memorial was dedicated Sept. 11, 2011 at 421 W. Ohio St. along the canal. This memorial honors those who died aboard the U.S.S. Indianapolis, the last American ship to sink in World War II. The names of the ship's company and one passenger who made up the final crew are engraved on the south side of the monument, which is shaped like the ship. Of the 1,200 sailors aboard, only 318 survived. Those who survived erected this monument on the north end of the Canal. 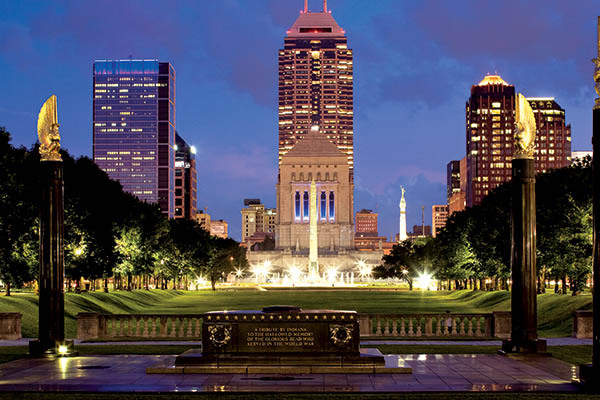 Veterans' Memorial Plaza, located north of the Indiana War Memorial, was completed in 1930 as an honor to Hoosier veterans. In 1975, grassy areas were added and trees were planted, honoring the Bicentennial of the Declaration of Independence. 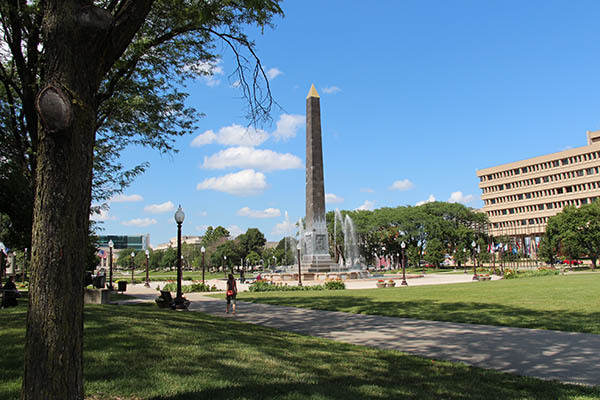 The 100-foot tall Obelisk fountain in the center of the park stands as a symbol of the hopes and desires of the nation. Near the base of the Obelisk are representations of law, science, religion and education. 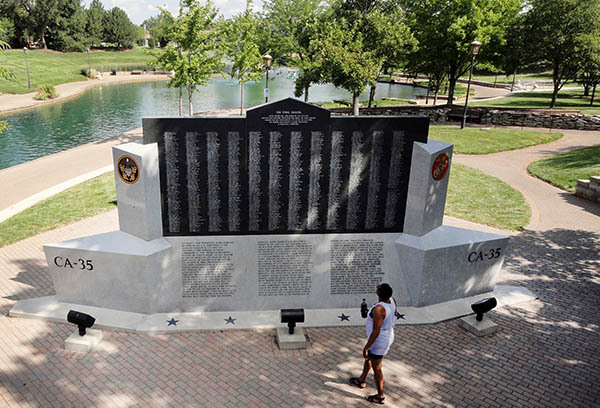 Veteran's Memorial Plaza was reopened and rededicated after a year of full restoration. Among the maintenances: repaired brick pathways and flagpoles, new flowers and flowerbeds, new trees and more. 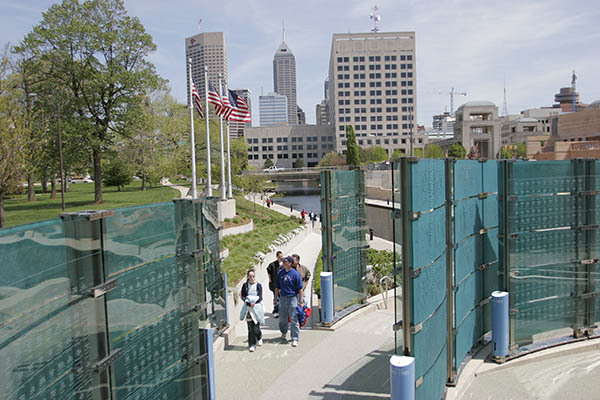 Use our attractions finder to see these memorials on a map and plan your day in Downtown Indy.